You are invited to join us for the launch of a new book from Ali Rattansi, Formerly Professor and now Visiting Professor of Sociology, published by Manchester University Press. This book is the first single-authored critical engagement with the major works of Zygmunt Bauman. 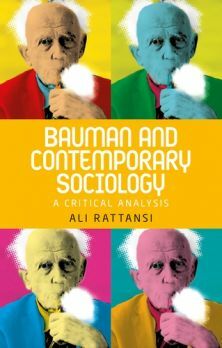 Where previous books on Bauman have been exegetical, here an unwavering ight is shone on key themes in the sociologist’s work, exposing serious weaknesses in Bauman’s interpretations of the Holocaust, Western modernity, consumerism, globalisation and the nature of sociology. The book shows how Eurocentrism, the neglect of issues of gender and a lack of awareness of the racism faced by Europe’s non-white ethnic minorities seriously limit Bauman’s analyses of Western societies.At the same time, it points to Bauman’s repeated insistence on the need for sociologists to take a moral stance in favour of the world’s poor and downtrodden as being his most valuable legacy. The book will be of great interest to sociologists. Its readability will be valued by undergraduates and postgraduates and it will attract a readership well beyond the discipline. Professor Rattansi will give an overview of his research and findings followed by a discussion chaired by Professor Chris Rojek. All guests are invited to a small reception following the main event. The book will be on sale to guests at a discounted rate of £10.